The NSW Police Force plays a vital role in responding to and providing support for victims of crime. From reporting crime, the initial police response, the investigation, victim support & referral, attending court, the return of property and more. The NSW Police Force Customer Service Charter has been developed to build and enhance relationships and partnerships with our community. Our customers are victims, witnesses, the community and our internal colleagues and we are committed to being accessible, being professional and helpful, taking appropriate action and keeping you informed. It is the role of police to respond to crime, emergencies and other calls for assistance by land, sea and air. When a crime is reported to be occurring or has just occurred, uniformed police will generally be the first to attend the scene. As first responders, police have a duty of care to ensure the safety of the victim/s and this may include arranging for an ambulance. The uniformed police will speak to the victim to get their personal details, ask what happened, ask the victim if they can identify the offender, ask for a description of the offender and any other information that could assist the police in finding the offender. Police may also ask for details from witnesses to the crime. Once the incident or crime has been reported to police face-to-face, you will be given a Victims Card to keep for future reference. 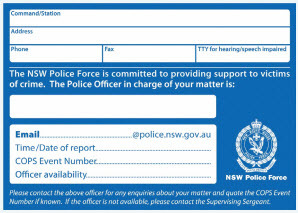 On the front of the card are the contact details for the officer in charge of your matter. This includes their name, email address, police station, phone number, COPS Event Number and information on who to contact if the officer is unavailable, if you need to call for any enquiries. 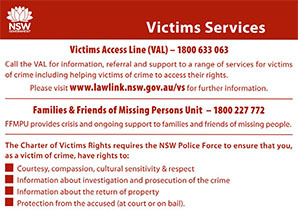 On the back of the card are important contact details for the Victims Access Line (VAL) which is operated by Victims Services, Department of Attorney General and Justice. VAL provides information, referral and support to a range of services for victims of crime including helping victims to access their rights. If you have been the victim of an incident or crime we will attempt to contact you within 7 days. This will be by phone, SMS or email. Encourage you to contact police if you change your contact details and need or have any further information. Victims support and referral cannot be fulfilled solely by the NSW Police Force. We work with other agencies within the justice system to improve the response and outcomes for victims of crime. Police will provide you with information about support services. You will be referred to the Victims Access Line (VAL), run by Victims Services, Department of Attorney General and Justice, who can provide you with information, referral and support to a range of services for victims of crime. Victims of violent crimes that have occurred in NSW may be eligible for free face-to-face counselling through the Approved Counselling Scheme. Crisis and ongoing support to families and friends of missing persons is provided by the Families & Friends of Missing Persons Unit (FFMPU), Victims Services. Many, but not all NSW Police Force Police Area Commands/Police Districts, have specialist officers who can provide support and referral. If you would like one of these specialist officers to assist you, ask at your Police Area Commands / Police Districts if they are available. ACLOs are civilian employees of the NSW Police Force who work closely with the Aboriginal community. Part of the ACLOs responsibilities include providing an avenue for community members to report crime and to encourage Aboriginal people to work with police to develop programs to address crime and violence in their communities. DVLOs are specialist police officers trained to provide support and referral in relation to domestic and family violence. Their role is important in developing and maintaining partnerships with other government and non-government agencies for victim support including follow up services, such as refuges. Most Police Area Commands/Police Districts have one or more DVLOs. MCLOs are civilian employees of the NSW Police Force who strengthen links between local police and their culturally diverse communities. Part of the MCLOs duties include victim support and follow up, basic language assistance and network referrals. MCLOs can assist victims to report crime. GLLOs are specialist police officers located in a range of areas including metropolitan and regional. These officers are specially trained to deal with gay, lesbian, bisexual, transgender and intersex (GLBTI) issues. GLLOs are available to assist GLBTI victims of crime and are sensitive to the law enforcement issues of the GLBTI community. They maintain partnerships with key external agencies and organisations that provide a range of services to GLBTI communities. YLOs are specialist police officers trained to deliver crime prevention programs to reduce victimisation and youth crime. They maintain networks with relevant agencies to provide support and referral. Most Police Area Commands/Police Districts have a YLO. SLPs are specialist police officers who work in high schools across NSW, including public, religious and independent schools. As part of their duties SLPs support victims of crime, conduct crime prevention workshops into targeted local crime issues like cyber crime, knives and bullying. SLPs work with Principals in targeting local crime issues as well as conducting major incident follow up at high schools. CPOs are specialist police officers who work with the community across NSW, including local residents, government agencies, council and shires, business and commercial owners, managers and staff. As part of their duties, CPOs support victims of crime and conduct crime prevention workshops into targeted local crime issues like shoplifting, anti-social behaviour and vandalism. CPOs work with the council or shire in addressing crime risk in relation to development planning. CPOs engage with the local community to address local crime issues. They conduct Community Safety Audits and work with individuals to assess their crime risk. CPOs help to decrease the fear of crime by conducting crime risk assessments of residences and business locations. VIPs are members of the community specially trained to assist police and the community in specific duties. VIPs do not wear a police uniform or undertake the same duties as police. They assist police in promoting crime prevention activities, maintaining local police registers, assisting with short-term child minding at local police stations and providing support to victims of crime and witnesses attending court. One of the main roles of the NSW Police Force is to detect and investigate crime and prosecute offenders. The investigation of a crime can take weeks, months or even longer depending upon the amount and type of evidence required to complete the investigation. Usually uniformed police will be the first to attend the scene of a crime and in some instances the matter will be referred to detectives who will take charge of the investigation. During the initial investigation police will interview victims, witnesses, record details, assess the victims need for protection and collect physical evidence. Protection orders are available to ensure the protection of victims. Allowing police to conduct forensic examinations of crime scenes can assist in the criminal investigation process and influence the outcome at court. Inform the victim of the outcome of the criminal proceedings against the accused and the sentence (if any) imposed. Released on bail. If a victim or witness fears for their safety the police will inform the prosecutor who will ensure that the court takes this into account when assessing the bail application. Bail conditions can be imposed on the accused by the court and if the accused does not comply with those conditions, police can arrest the accused for breach of bail. Kept in custody (also known as on remand) until the matter goes before a court. Youth Conferencing. The degree of harm caused to the victim is a valid consideration in determining whether action under the Young Offenders Act 1997 is appropriate. Police will advise victims of the date and place of a court hearing of any charge laid against the accused. Victims of crime do not need to have their own lawyer for court as they are witnesses for the prosecution. The prosecution represents the community. Depending upon the type of charge against the accused and the court in which the matter will be heard, the prosecutor may be a police prosecutor or a prosecutor for the NSW Office of the Director of Public Prosecutions (ODPP). Police investigate crimes and commence criminal proceedings. They will prosecute summary matters in the local court, except if the charge relates to the sexual assault upon a child or the prosecution of a police officer. Police will refer serious criminal matters to the ODPP who then take over the prosecution of the case. How the victim can be protected from unnecessary contact with the accused or defence witnesses during court proceedings. If a victim has any concerns about their safety and requires protection from the accused, they should immediately tell the investigating police officer who will tell the prosecutor. The prosecutor can then inform the court of any concerns in relation to the protection of the victim whilst at court. In some courthouses there are separate waiting rooms for victims and witnesses. Prior to going to court the victim can arrange a time and place to meet with the prosecutor or support person who can then show the victim the safest place to wait. Witness expenses may be available for the days a witness goes to court. This may include meals, transport and accommodation costs. The rates of payment are not intended to fully compensate witnesses for their expenses and losses; rather they are intended to reduce the financial hardship incurred by attending court as a witness. The witness expenses claim form must be authorised by the police informant and/or police prosecutor and/or the ODPP prosecutor prior to submitting the form to the court officer. When an accused person pleads guilty or is found guilty of charges laid against them, they then become known as an offender. After an offender has been convicted but before they are sentenced, legislation allows in certain circumstances (the Crimes (Sentencing Procedure) Act 1999) the victim an opportunity to give the court a written statement. This statement is known as a ‘Victim Impact Statement’. It includes details of how the offences that the offender has been found guilty of, have affected the life of the victim. The statement can only relate to the crime or crimes of which the offender has been convicted. A victim impact statement is voluntary. The victim must advise the prosecutor if he/she wants to make a victim impact statement to be given to the court. The officer in charge of the investigation should ensure that all material contained in a victim impact statement complies with the legislation. The police prosecutor or Office of the Director of Public Prosecutions (ODPP) may provide the officer in charge with advice in this regard. Once a victim statement is accepted by the court, the reading of the victim impact statement to the court is optional and voluntary. The statement can be read out by the victim, an immediate family member of the victim or representative of the victim. It cannot be read out by the prosecutor. Before preparing a victim impact statement, it is important to know that when it is accepted by the court it becomes part of the court case. This means that the victim or author of the statement could be subjected to possible cross-examination, the offender can read the statement (but not keep a copy), the statement becomes a public document (except in relation to children) and the media may gain access to the statement and report on the contents of the statement that are read out or referred to in court. Victims Access Line (VAL) – 1800 633 063. Please visit Victim Services for further information. The Witness Assessment Service (WAS) operates statewide and provides services for victims and witnesses. It operates within the Office of the Director of Public Prosecutions (ODPP). A WAS professionally qualified worker is located in each of the ODPP offices. The service is available to victims and witnesses of crime involved in cases that are being prosecuted by the ODPP. WAS can accept referrals once police have finished their investigation and charges have been laid against the alleged offender. any person experiencing trauma difficulties about attending court. assistance with victim impact statements, debriefing and post court follow-up. There is a Witness Assistance Service Officer at each of the offices of the ODPP. Or please visit Being a Witness for further information. The NSW Police Force, Forensic Services Group utilises specialist police officers or other civilian crime scene examiners to attend crime scenes. At crime scenes where fingerprint examinations are undertaken there will often be fingerprint powder residue left at the scene. The NSW Police Force is not responsible for the cleaning of this residue but can provide information as to how the residue can be cleaned and removed. The crime scene examiner may give you a card with the following information on how to remove fingerprint powder. Your premises have been examined for fingerprints by the use of white and black powders. These powders may be removed from glass, tiles, plastic and painted surfaces etc, first by wiping excess powder with a dry cloth and then using an ammonia based cleaning agent. Cleaning agents which are ammonia based at the date of preparation of this ‘How to clean’ information are ‘Jiff Once Over’, ‘Spray & Wipe’, ‘Nifti” etc. Prior to using any such cleaning agents, a check should be made to ensure that the cleaning agent is still ammonia based. Please read and follow the directions for use before using any ammonia based cleaning agent. Please note that ammonia based cleaning agents should not be used on varnished/ polished furniture. This is not an exhaustive list of the surfaces on which ammonia based cleaning agents should not be used and the directions for use should be read and followed to ensure it is safe to use the cleaning agent on a particular surface. If you notice fingerprint powder on carpet, it should be firstly dry vacuumed and then cleaned with a carpet cleaning agent. The use of chemical enhancement techniques to locate or enhance trace biological evidence at crime scenes is also common. Cleaning of the residues left by these chemicals at crime scenes is the responsibility of the NSW Police Force, Crime Scene Service Branch (CSSB). Cleaning requires specialist techniques usually sourced from private contractors, who are required to stringently adhere to Work, Health & Safety guidelines. It is the responsibility of the user/owner/relatives/ occupiers of the premises and/or vehicles to clean up biologically contaminated crime scenes such as suicides, deceased persons, shootings and decomposed bodies where no chemical enhancement techniques have been used by NSW Police Force officers. Where any doubt exists about who is responsible for cleaning a crime scene ask the officer in charge of the investigation to contact the CSSB Referral Officer. The Victims Rights and Support Act 2013 governs the circumstances under which financial assistance may be available to aid with crime scene clean-up. property collected at a crime scene for evidence that is referred to as an “exhibit”. When police recover stolen property they will attempt to identify the owner of the property and arrange for the property to be returned to its rightful owner. If you see your property for sale in a pawnbroker shop, speak to the owner of the shop and let them know that it is your property. Then report the matter to your local police station. In certain circumstances your property may be retained by police as evidence for the duration of a hearing and any pending appeals. The length of time that your property is kept by police varies and this could be indefinitely if it is required for forensic or scientific testing. For example, murder weapons and implements used in armed hold ups. In many cases, police can photograph, fingerprint or analyse property as needed, then return the property to the owner. Police can often satisfy the onus of presenting evidence at court by tendering photos of the exhibit with a sworn testimony that the exhibit exists. Police cannot always guarantee that property will be returned. In some circumstances it could be destroyed by the analysis process or be deemed unsafe to return. Exhibits may also need to be retained for certain offence types and until any appeal period expires. You should contact the officer in charge of your matter if you have any concerns about the return of your property, be it recovered stolen goods or property being used as an “exhibit”. If they are unavailable ask to speak to the supervising Sergeant. If your property is recovered or no longer required as an “exhibit” you will be notified about how to collect your property. You will need to tell police within 28 days whether you want to collect and take your property or not. After 28 days police may destroy any uncollected property. The NSW Police Force does not maintain the victims registers. However, police should inform victims about the existence of victims registers. The victims registers contain information about adult offenders, young offenders and forensic patients who have been found guilty of a crime, sentenced and currently in custody or if they were found not guilty by reason of mental illness or unfit at a special hearing and received a limiting term. A newly revised Charter of Victims Rights - Part 6A of the Victims Rights and Support Act 2013 No 37 explicitly applies to victims of forensic patients. - impending release. change in classification, escape, death or eligibility for absence from custody of an offender. - assists registered victims to make submissions on parole and eligibility for absence from custody of serious offenders. To be eligible to join the register, the person must be a victim of the sentenced offender or a family representative of a victim who is deceased, incapacitated or under the age of 18. The Juvenile Justice Victims Register Officer is the primary point of contact for victims of juvenile offenders supervised by Juvenile Justice NSW. The Specialist Victims Support Service (SVSS),Victims Services (VS) is the primary point of contact for victims of forensic patients. The Specialist Victims Register is managed by the SVSS on behalf of the Commissioner of Victims Rights. The SVSS sits within Victims Services and is the primary point of contact for victims of forensic patients. The SVSS can provide registered victims with crisis referrals, planned support and counselling, Tribunal process support, communication and education from early in the justice process. This includes assisting victims to make submissions to the Tribunal and supporting victims to attend and understand Tribunal hearings. Please visit www.victimsservices.justice.nsw.gov.au for further information. The Victims Support Scheme, handled by Victims Services, provides a coordinated approach to information, support and referral, with an emphasis on immediate assistance and access to counselling. Through Victims Services, victims will be able to access the services when they need them most. Victims will be allocated a support coordinator who will conduct a comprehensive assessment of each situation, develop a tailored plan and then guide the victim through the criminal justice and human services systems. The support coordinator will provide information, referrals to other services and ongoing advice. Family members of homicide victims can claim for funeral expenses and crime scene clean up. Family members of homicide victims can access justice-related expenses. Dependent family members and parents of homicide victims Information on all aspects of the Victims Support Scheme is handled by Victim Services. The Charter of Victims Rights is contained in the Victims Rights Act 1996 (NSW), and applies to all NSW government agencies who work with victims of crime. A victim will have access where necessary to available welfare, health, counselling and legal assistance responsive to the victim's needs. What can victims of crime expect from NSW Police Force? Provide victims with a victims' card. Victims' cards contain the name and phone number of the Officer in Charge of the matter, and the COPS Event Number. The card also includes contact details for the Victims Access Line and information about the Charter of Victims Rights.